Hey there! 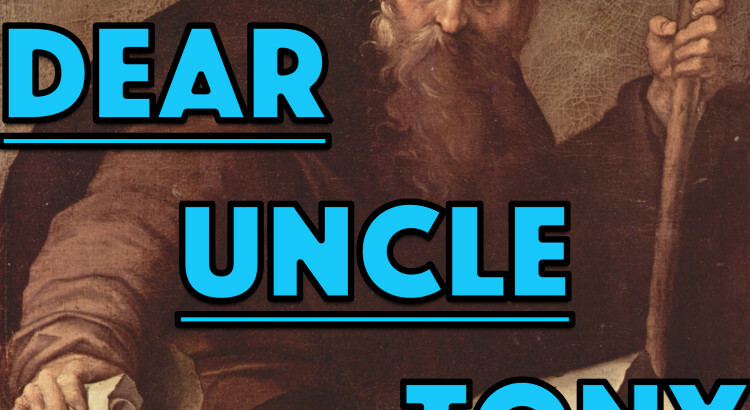 Welcome to the very first episode of Dear Uncle Tony, the literary, arts, and storytelling podcast of the Xi chapter of St. Anthony Hall. Our goal with this podcast is to bring Xi brethren closer together by collecting and spreading our work to St. A’s all over the world. We’re going to have a little bit of everything: original music, poetry, and essays; Hall stories both new and old; and interviews with Xi alumni. Also, this is a podcast for adults, so be prepared for some saucy, salacious, or irreverent language. 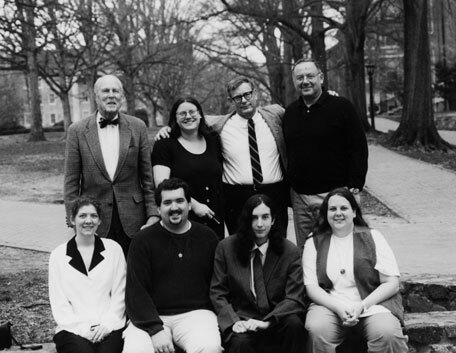 Getting ready for Swing Out 2015, I discovered a picture from 1996 when we had the main meeting at the Carolina Union. A stroll back through campus provided us with a lovely backdrop for a group picture. Xi active Alice Wilder, staff writer for the Daily Tar Heel, presents a different side of Southern colleges than what’s usually shown on national media. It’s time to get over the notion that schools below the Mason-Dixon line are devoid of meaningful activism or that UNC is somehow special in this regard. You can view all of her DTH writings here. 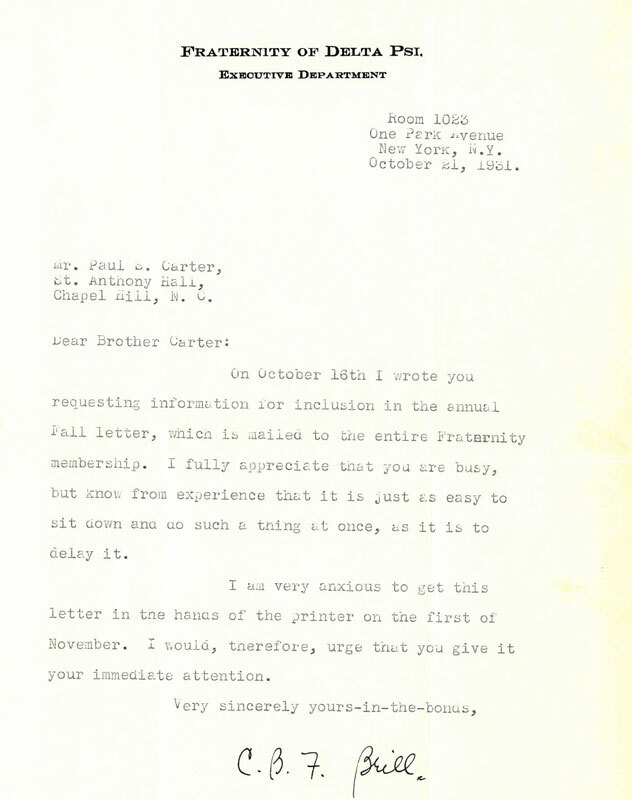 A timely reminder from C. B. F. Brill, then serving on the National board of directors, to Paul Carter of Xi in 1931 that sometimes, doing the thing that is perpetually on your list is as easy as doing it right away and getting it over with. Lots and lots has changed about Franklin Street since we all were junior monks prowling the brick walkways of Chapel Hill. This article from the Independent weekly speaks to some of the concerns about growing a business in downtown Chapel Hill. Franklin Street at a crossroads | News Feature | Indy Week. As I read, I thought, that name sounds really familiar. I couldn’t mentally source it until I recalled the fantastic autograph book we have at Xi – currently on loan to Wilson Library – and then, I remembered. Iowa Michigan Royster, Xi brother from the late 1850s, is mentioned here. Sometimes, remembering the little details helps connect the dots. 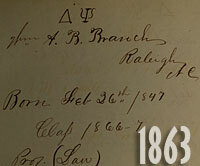 The future of the University’s side of Greek system leadership rests on the shoulders of Winston Crisp. 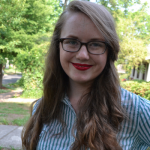 The vice chancellor for student affairs will provide the vision as to when, or if, Jenny Levering, the assistant dean for fraternity and sorority life, will be replaced. But the process is still uncertain — and few variables have been decided. Home of the iconic “Bowl of Cheese” among other questionable gastronomic items, the Ramshead Rathskeller returns to Franklin Street. Though I personally had never been much of a patron of the Rat, I enjoyed knowing it was there – that someone of my parent’s generation or my grandparent’s generation could have gone there for a meal, or a beer, or just to carve their name in the wall. That I could eat in the same place which once might have hosted Brooke Gardiner or George Strong or Skip Awalt. One of those great college-town establishments that has become harder and harder to find over the years. 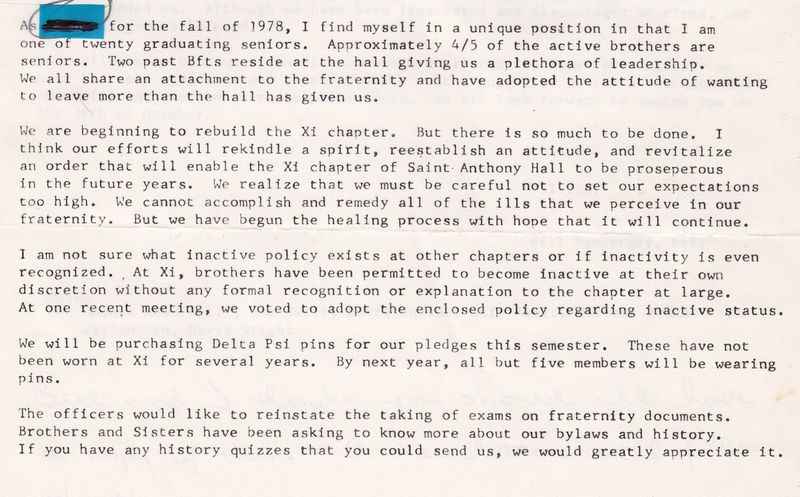 In a letter dated October 24, 1978, Bro. Bill Bamberger describes a number of new initiatives – as well as old ones rekindled – the undergraduate chapter was undertaking at the time. This is something I grabbed completely at random from amongst the unsorted material in the chapter archives and it turned out to describe the infancy or rebirth of probably a dozen different traditions still in place at the Hall: pledge tests, the Tattler, guest speakers, maintaining the general registry, inviting alumni to meet at the Hall around Homecoming, Parents Dinner, and on and on. I found the frankness of this letter – and its fond praise of Bro. Skip Awalt, so recently deceased – surprising and refreshing, a candid account of a time when the Hall’s long-term health and sense of self sounds especially tenuous. I was also struck by how many of the names he mentions are readily familiar to anyone involved in the last three decades of Hall life. In the course of the first page of the letter, Bro. Bamberger used a term we do not allow to be recorded and I obscured it through application of a removable “sticky” tab and some magic marker applied in turn to that tab. The texts and materials of course remain whole in the document itself and I take special pleasure in the anonymous circle someone later penciled around that word to mark the taboo. 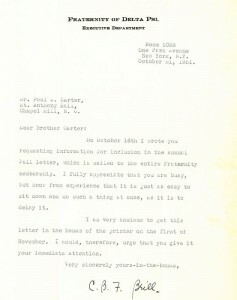 The letter’s second page includes the full text excerpted above regarding thirty one bids. I was active the semester we handed out twenty one and had always assumed that was the record, but no, not even close. 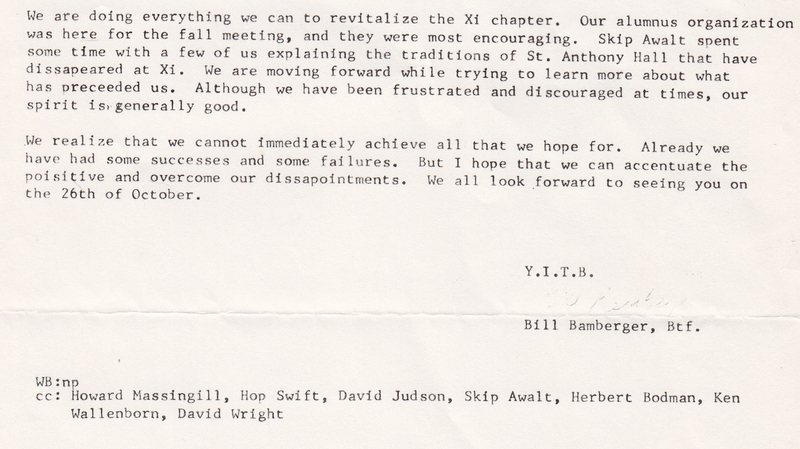 The third scan from this letter includes a carbon-copy list that reads like a Who’s Who of Xi: Hop Swift, Skip Awalt, Herb Bodman and many others. There are a lot of documents like this waiting to be preserved. The work of the siblings has been magnificent when it comes to preserving this ourselves and I say that with absolute sincerity. There are decades of history inviting us to peruse them, sitting in the vault – much of it already sorted and organized! – and it’s my hope to be able to make all of that available to you as best I can. Many, many snaps to Bro. Peter Pendergrass, Sis. Courtney Rosenthal, Sis. Fiona Matthews, Sis. Kelly Garner and countless others who have sorted and organized and scanned and otherwise made the vault a significantly less scary place than it could be. We are truly lucky, as an organization, to have these materials available and it is incumbent upon us to figure out the best way to preserve them so that future generations of Xi can look back and realize abruptly that this or that innocuous document may be the only portrait of whatever features loom large in the chapter’s future life.